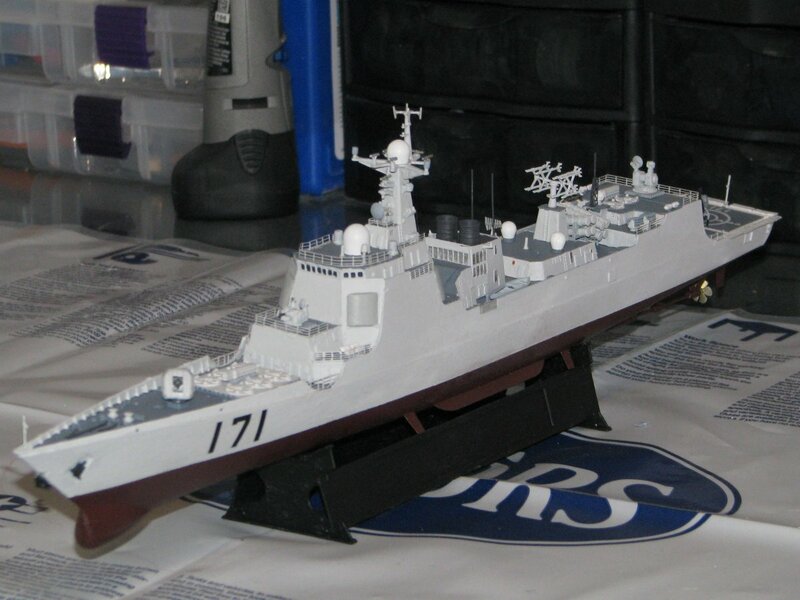 This model is a 1/350 scale model depiction of the Chinese People's Liberation Army Navy (PLAN) DDG-170, Lanzhou, which I am building the sister ship, DDG-171 Haikou. 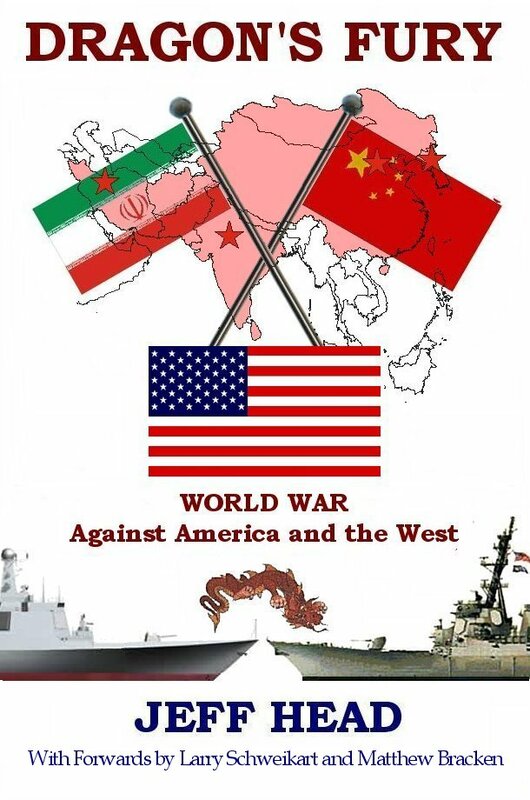 These are the Chinese most advanced area air-defense and all-purpose guided missile destroyers using an AEGIS-like battle management system with four Phased Array Radars (PARS), a vetical launch system (VLS) for 48 medium to long range guided anti-aircraft and anti-missile missiles, and that sophisticated battle management system. The PLAN has currently built and launched six of these vessels with at least two more building. 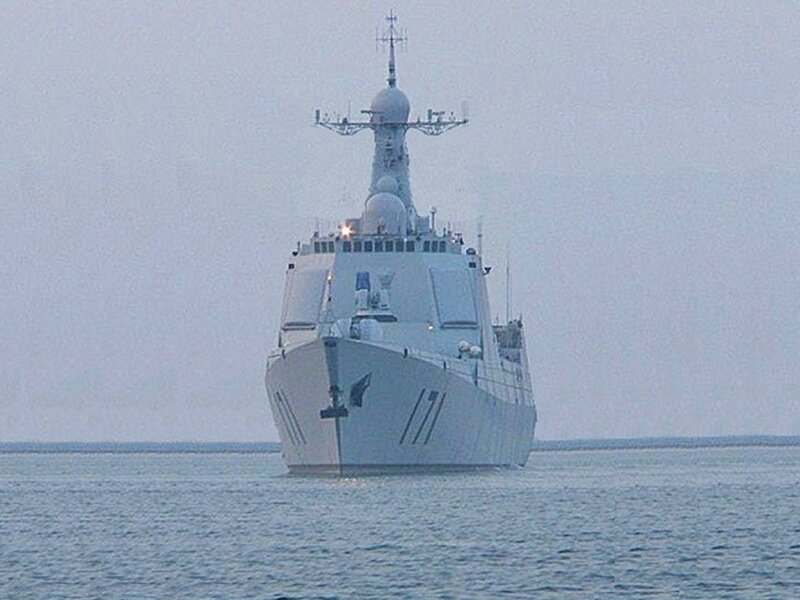 The vessels also include eight anti-shipping guided missiles, two 30mm Type 730 Close in Weapons Systems (CIWS), six torpedoe tubes and a deck and hangar for one medium sized anti-submarine warfare (ASW) or search helicopter. There are approximately 350 parts on eight sprues. 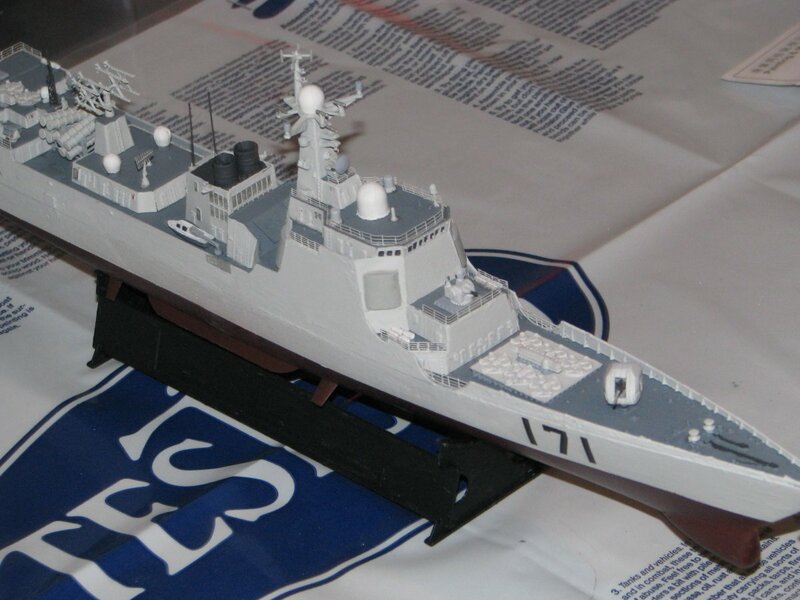 One sprue is a photo etched spru with fifty parts with sensors, the webbing around the helo deck and several personnel. The hull comes seperately and must be built as a full hull. 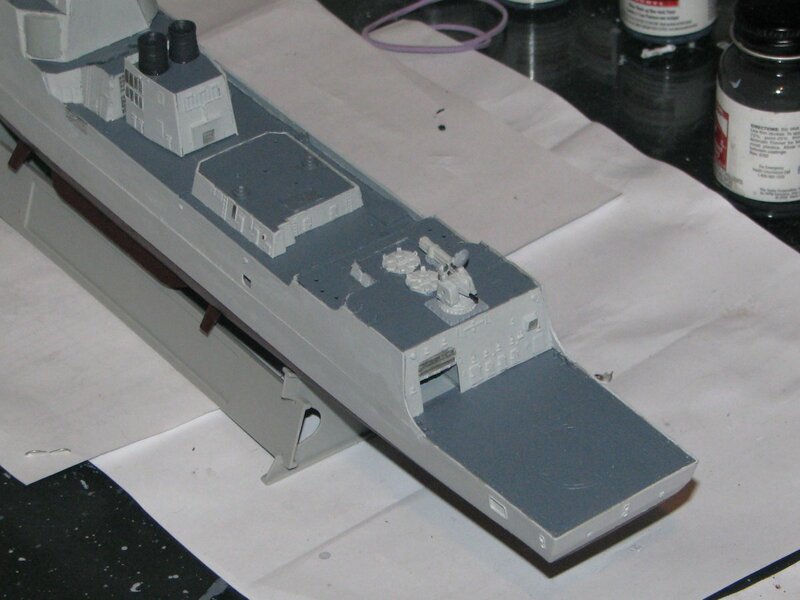 The entire main deck comes seperately as a single piece as well. Although I intended to build the full whole version in any case, I was surprised that this model did not offer a waterline version as most newer Trumpeter models do. The main gun can be built to elevate and rotate. The instructions are very nicely done with easy to understand steps and a lot of detail. 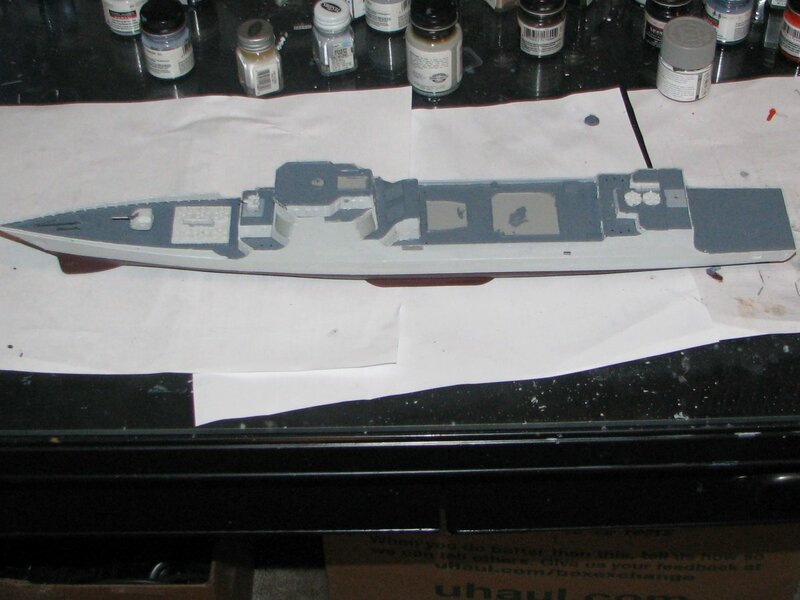 There is a full color painting scheme provided for correctly painting the vessel. 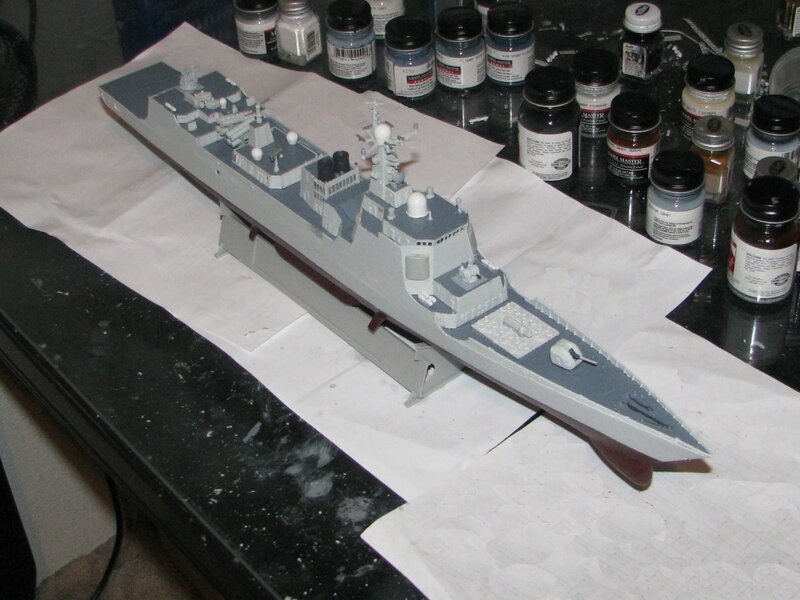 As this is part of my PLAN Aircraft Carrier strike group, the paint scheme will be the same as that of the carrier in major colors. 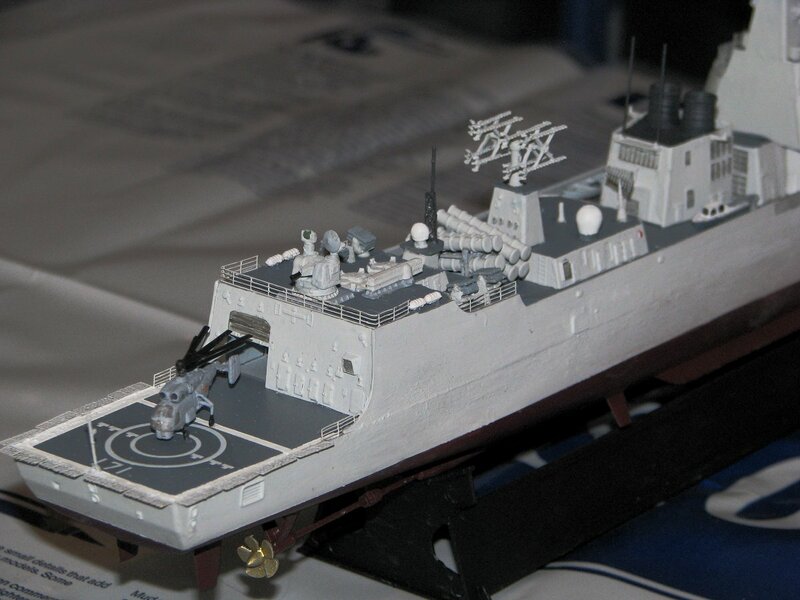 The decal sheet is also well done including all of the markings necessary to depict either the Lanzhou or the Haikou vessel, including a nicely done landing area for the helo. The model came in a very nice, heavy cardboard box with nice graphics. Lots of material, with the seven plastic sprues and one PE sprue, decals, clear plastic helo with balck rotors and landing gera parts. Instructions, paint scheme and decals. Very well designed instructions with detailed, yet easy to follow steps for building the model. 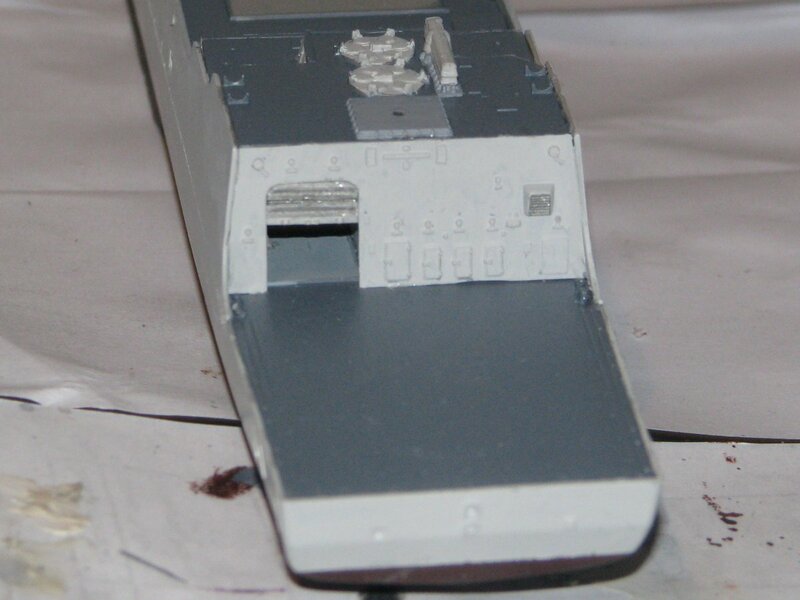 I masked off and painted the upper hull in the same light gray as the PLAN Carrier, and then let it dry opvernight, after also painting numerous deck housing and bridge parts the same. Basically all verticle parts will be light gray. 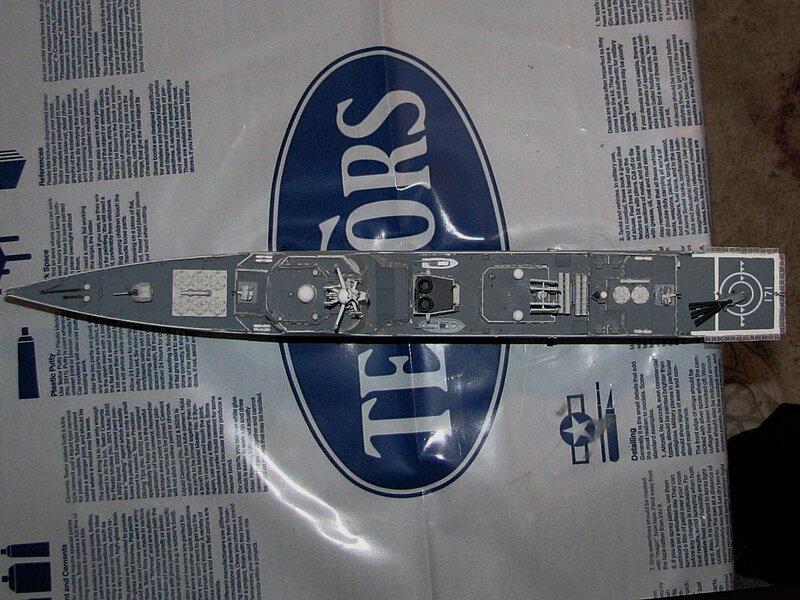 I then painted the main deck and various deck parts flat gray, which for testors is relatively dark. All decks will be that same color. The Main gin can be built to tutn on its mount and for the barrel to rais e and lower its elevation, I built the model to do this. 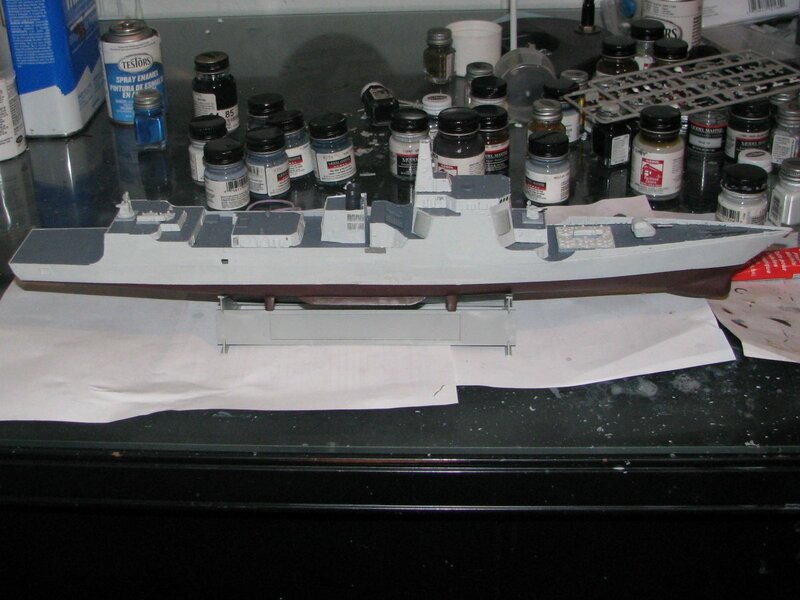 All decks are painted in TEstors flat gray. 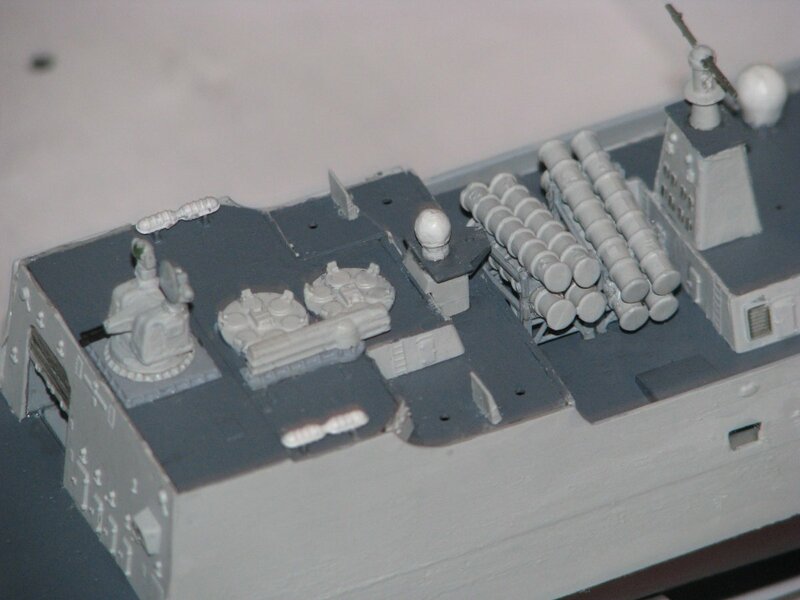 All major side housings and the VLS and gun mounts are painted in Testors Light Gray. 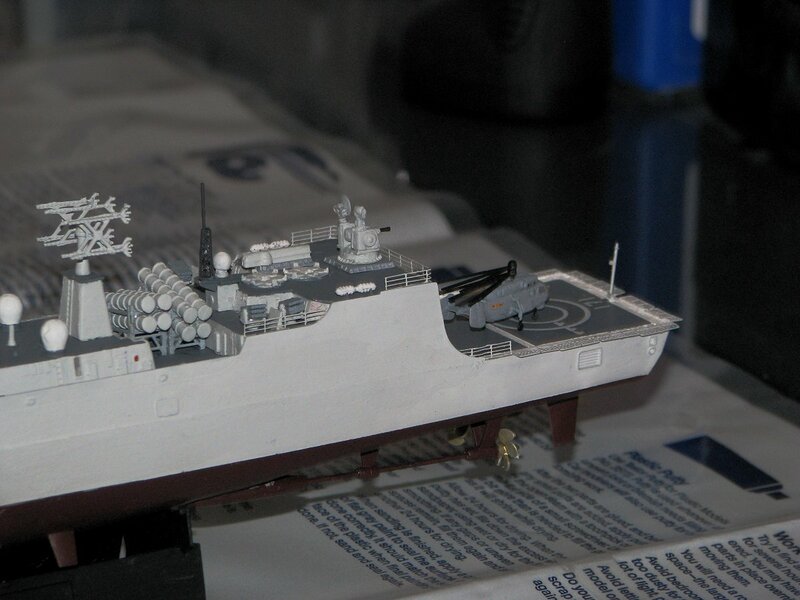 By painting the gun covering in off gray, and the CIWS in black, as well as the mount for the VLS missile reloader in a ghost gray, contrast can be added that is realistic and pleasing to the eye. I detailed the hanger with various poieces of equipment, and also cut the door to be shorter than the two provided. The long door covered the entire hanger which would have completely hidden the inside, but the shorter one was half height and also covered most of the opening. I wanted one 3/4's open and so carefully cut the 1/2 height door and removed a middle portion of the roll-up structure and then glued it back together again and painted the rull-up structure of the door with steel by testors. This is how all of that turned out. 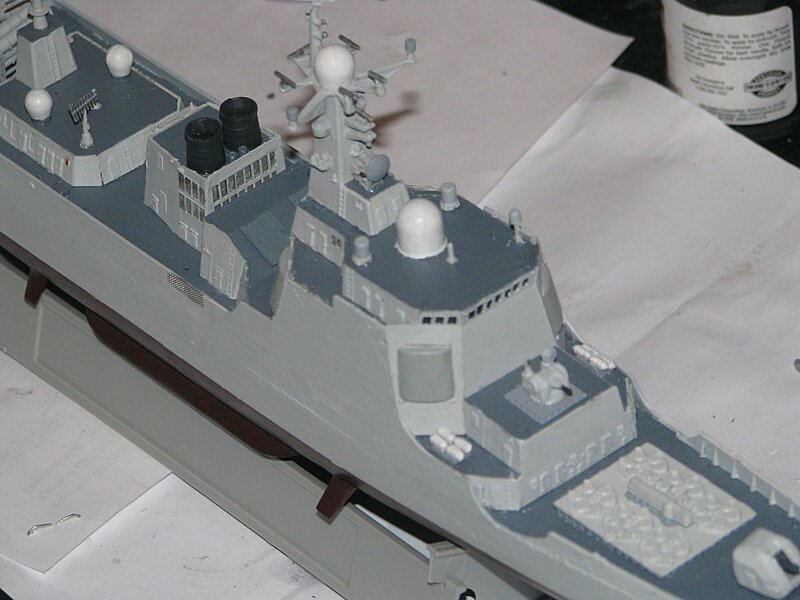 Continuing, I build the main forward deck housing with its PAR radars. This was not a straight forward process as the parts had to be build with very little support and they tended to want to move as far as their angle was concerned. This ocvcurred several times with this model as will be pointed out where the joints could have benefited from either holes and pins, or stronger flange attachements that held them at the right angle. 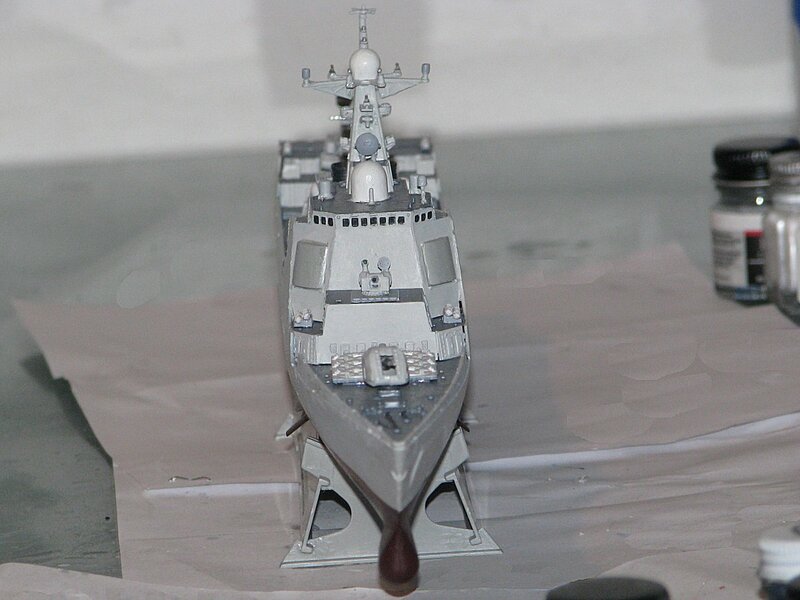 But, with careful attention, I was able to get them fitted properly, just be aware that this type of thing on this model can sometime test your patience and you need to work slowly, methodically, and with attention to detail. 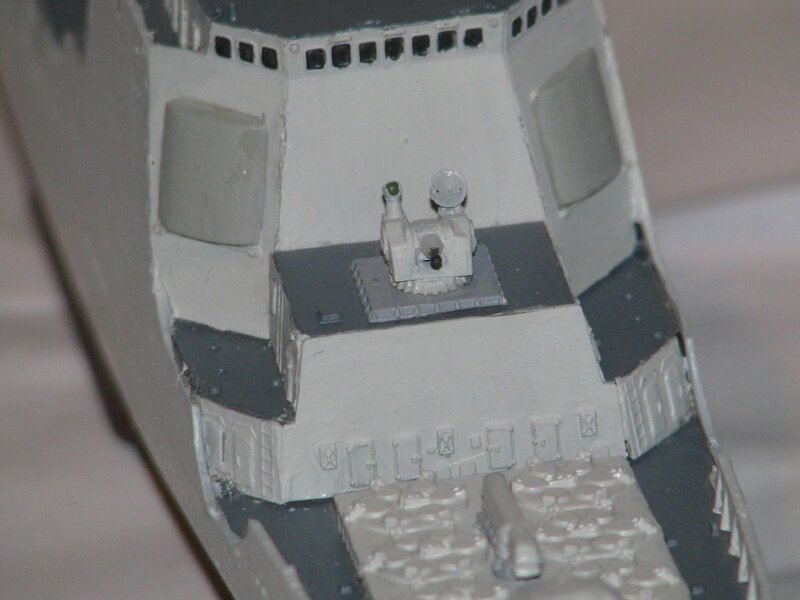 I painted the windows high up on the main deck housing using a weathered black, which is not quitre as dark or uniform as a standard flat black. I find, in the absence of cut out windows with smoked clear plastic inserts, that this provides a better glass solution. 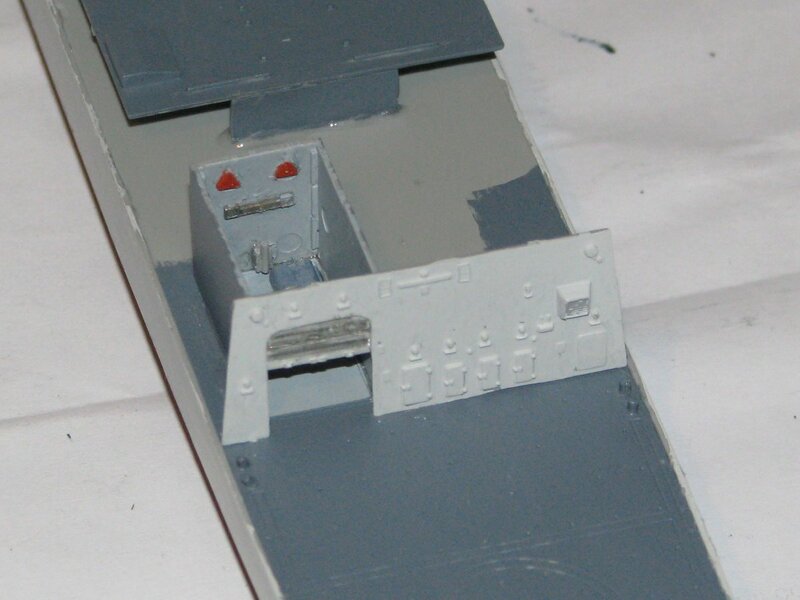 I then built the aft housing around the hanger. This is not as bad in terms of fit and maintaining correct angles as the forward housing, but it still has the same issues and care must be taken. Part of this issue with the fit now came was fitting the faired side panels along the side of the vessel to the sid of the center deck, to the main deck housing just discussed, and to the after housing around the hanger. Unless these pieces are positioned just right, a good seam along the side of the vessel is difficult to maintain and some sanding, putty, and careful alignement or realignment may be in order. All in all, it worked out nicels and is seen in the following pictures. 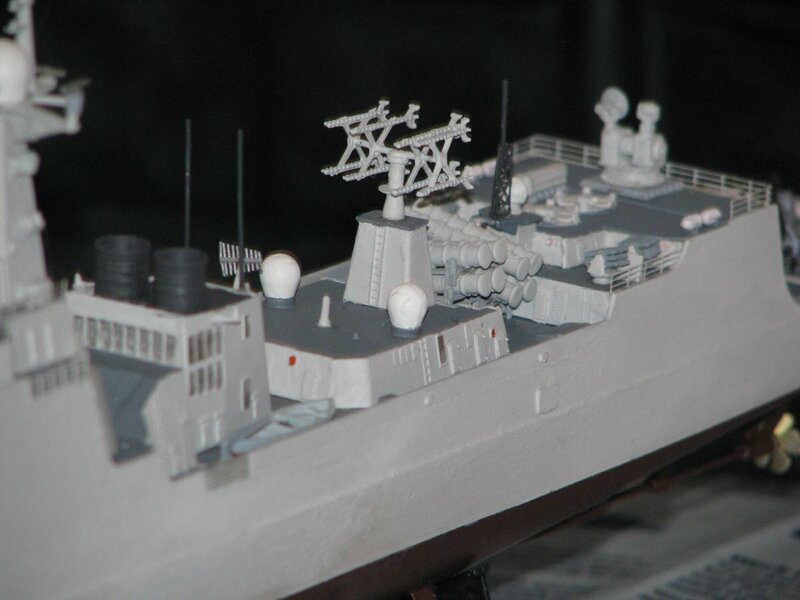 The main mast has many small pieces for antennae and sensors. They need to be cut off the sprues carefully and then handled carefull to be able to be properly placed. Attention to detail and patient, painstaking placement is the key here to build the mast and properly prepare it for the placement of all of those pieces. I found it easier to build the main structuire (this section) and then paint and place the smaller pieces later, many of which were small intricate assemblies of their own. I then build the Engine Exhaaust structure and the two funnels for the Gas Turbine Engines. These were painted in the weathered black I use, inside and out. I painted the exhaust panels on the sides of the structure using steel. 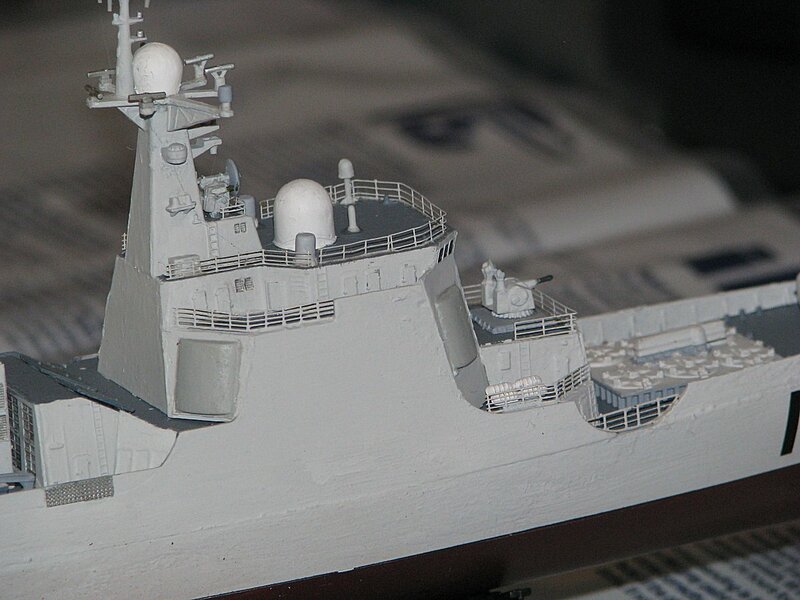 The details for the vessel at this point, particularly for the masts, are intricate, and as stated above, many of them involve fairly detailed assemblies of their own. 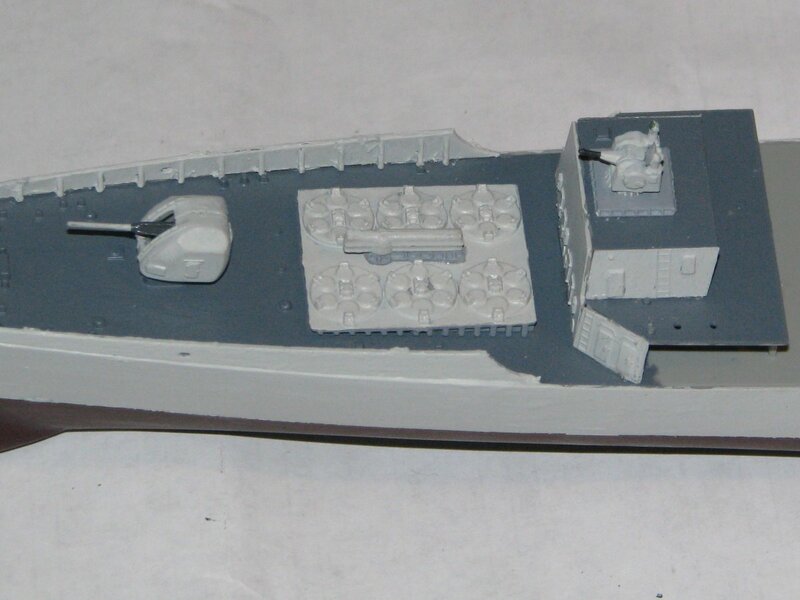 In addition, there are some inconsistanceies between the model configuration and the actual vessel. I have not placed those yet and intend to build them as seen on the vessel. For example, the antennae that are located on the exhaust structure are not cioncluded. There are four of these that need to be painted flat black. 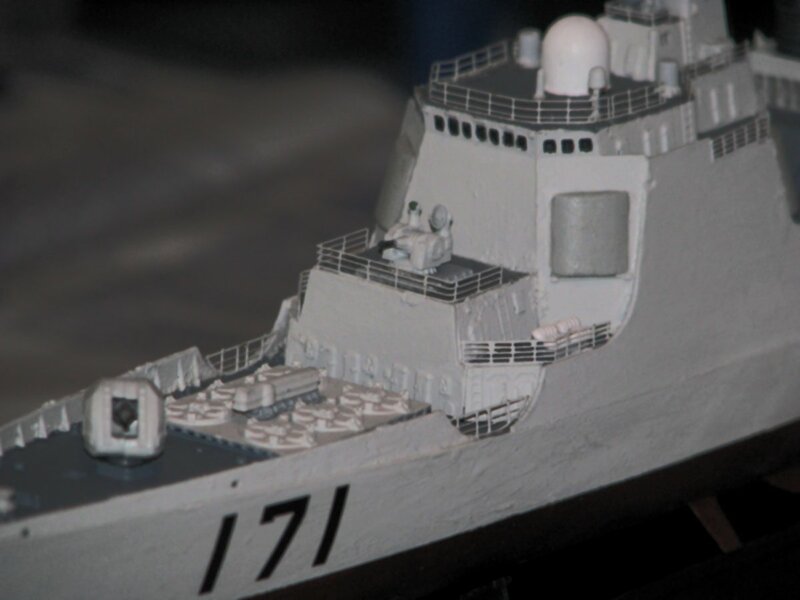 Also, the intricate antennae that are on the secondary housing are far too thick and configured towards the very initial configuration of the first vessel, DDG-170, LAnzhou. Since initial launch, this has changed and has a different configuration and much thinner more delicate antennae. I intend to build these as they now exist. Other than that, the life rafts, the sensors, the antennae, blast deflectors, and particularly the intricate and highly detailed anti-surface missile luncher quad packs were all built. Thoe quad packs are relatively difficult to put together. The joining of the parts is not too sturdy and you have to spend time, be patient, and put them together carefully and then let them dry and get strong before proceeding. when you do, the results are ver nice indeed. 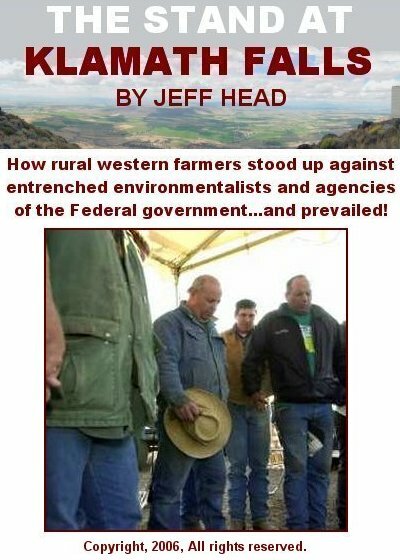 The long Memorial Day weekend here in the states benefited me because on two of those days I was able to spend many hours working as opposed to my normal routine of spending a couple of hours each evening after work. But, there's still lots to do. Building the various antennae and sensors mentioned above to the correct configuration. Building and placing the chaff and decoy lanchers. Building and placing the cranes and ship launches on each side. 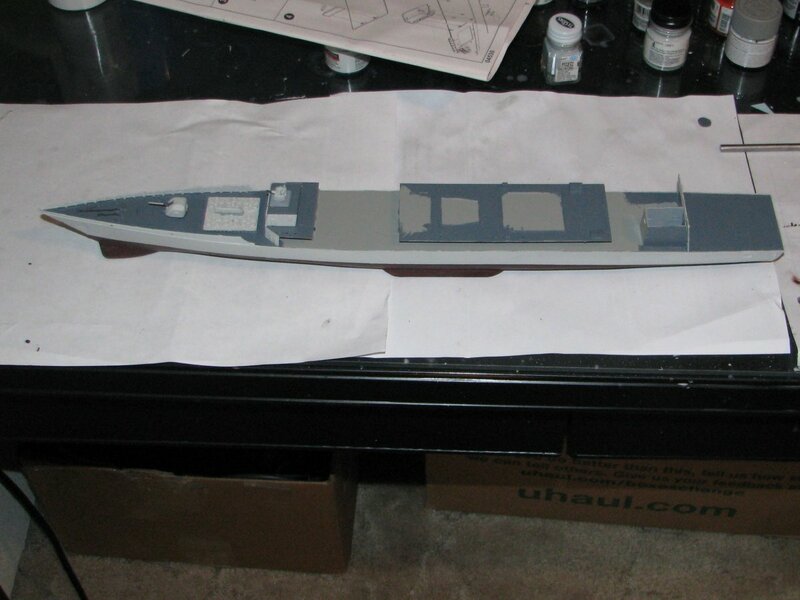 Building and placing the entire prop, propeller, and rudders, and then all of the photo etched railing and sensors (that came with the vessel and additional after market parts) to complete the realism of the vessel. Well, over the last week I was able to paint, cut and add the photo etch railing. 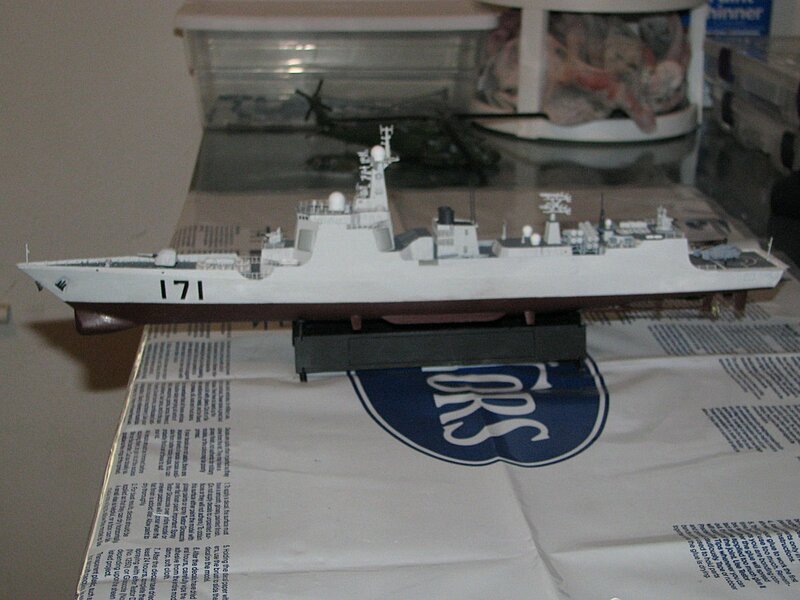 I did not by the specific railing for this model by Tom's Model or Gold Medal, I used left-over three bar railing from other vessels, notably the Kuznetsov. 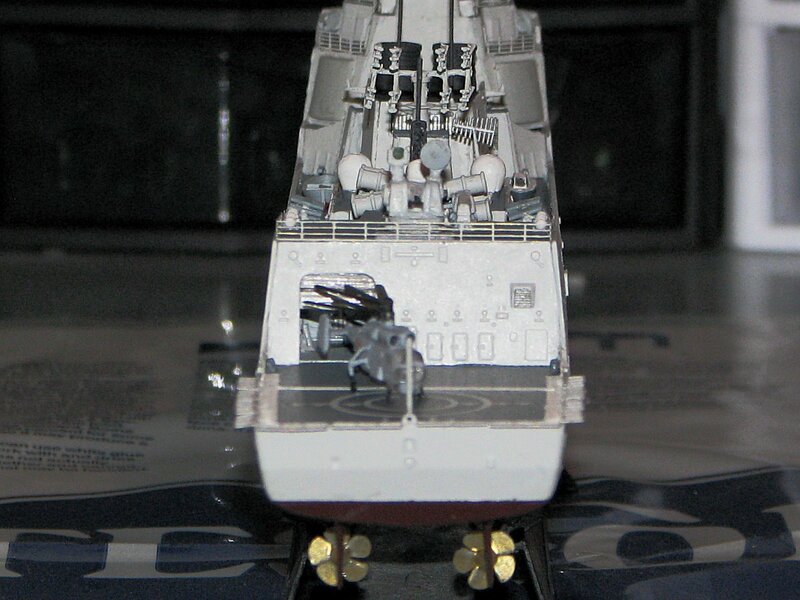 That was all that was really needed as the ship came with the curved railing to block the openings just aft of the main gun, and the helo raling/netting around the helo deck. I created the antennae and sensors for the comm and sensor areas that were defiicient, though I may buy the specific Photo Etch kit in the end for the large sensor array amid-ships. 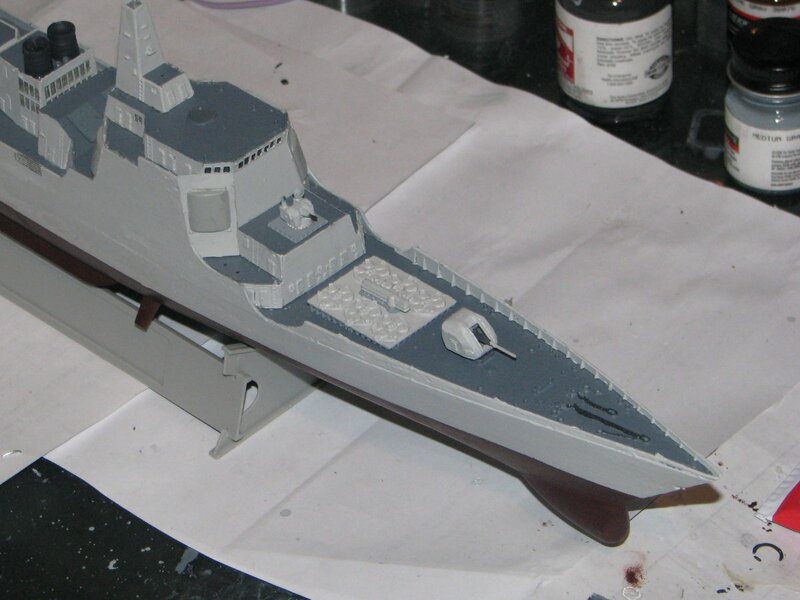 Also completed and installed the props and rudders as well as the two ships launches and their cranes. 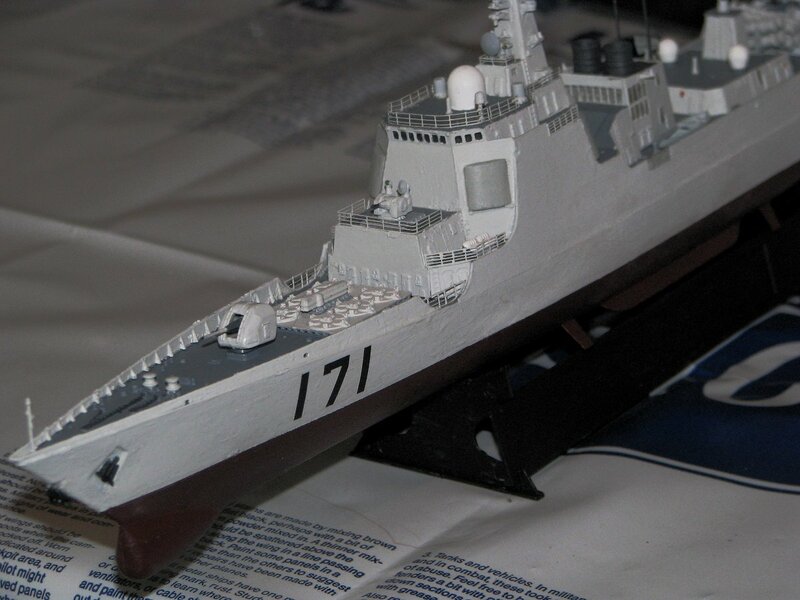 I am looking at completing the PLAN DDG-171 Haikou within the next several days...well ahead of the current schedule. After masking off and painting the landing area rectangle, I then built and painted the KA-27 ASW helicopter, building it with its rotors in the stowed positon, as it is being moved out of the hangar and onto the Helo deck preparing for take-off. 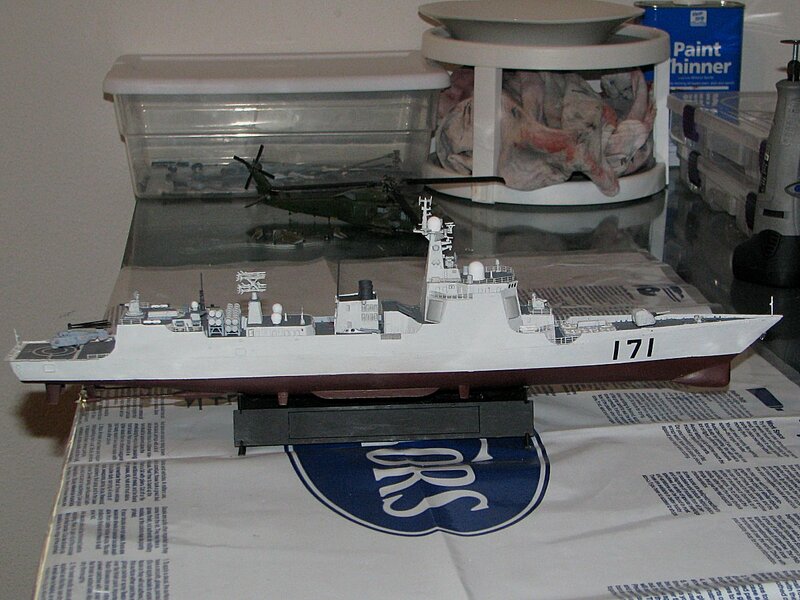 I then spray painted the model in gloss coat, applied the decals for Pennant Number 171 for the Haikou, and did the same for the helo. Once the decals dried, I did some touch up painting and other grooming, and then spray painted the model in dull coat for the final finish. Now it's on to Tamiya's 1/350 scale USS Enterprise, CVN-65, which I have had and now waited to build for over 20 years.